Posted on November 30, 1999 at 12:00 am. 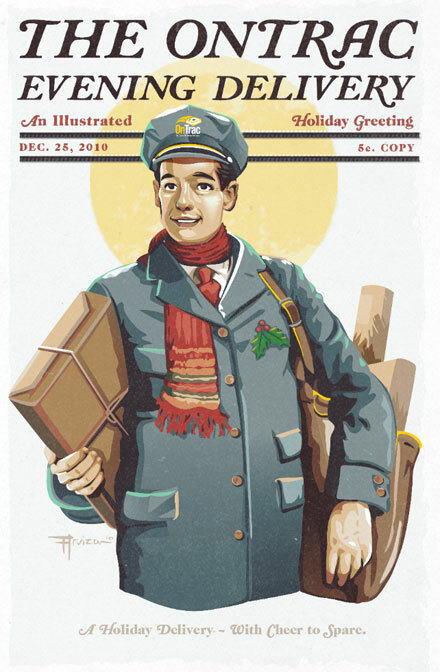 This Vintage inspired illustration was created in the spirit of the old Saturday Evening Post covers of the 1930’s-50’s. Harkening back to the golden age of America right down to the custom typography. I enjoyed collaborating with the talented folks over at Free Range Productions on this project for OnTrac Delivery. You've reached the illustration portfolio, blog and the place for all things made by Artist Jon Arvizu. Look around, enjoy and let me know how I can help with your brand. The store collection includes limited-edition, handmade silkscreens, letterpress coasters, small batch t-shirt designs and more.